This Is Definitely Not A 'Cute Little Jeep'!!!! Hey! 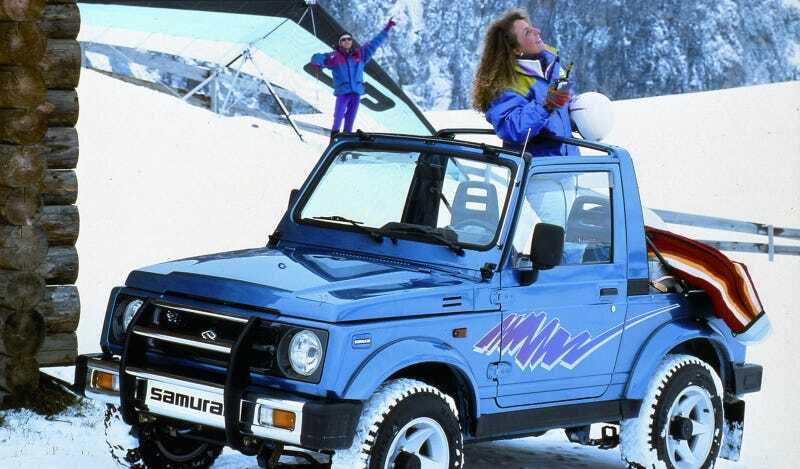 As you can see from the above available evidence, the Suzuki Samurai is a more-than-capable 4x4 with plenty of character and its own status! It will not be compared with anything else! It was built to feature many shades of purple and it will not apologize! And neither will this seemingly camouflaged specimen spotted by reader OMNI_GLHS, and they want to make sure you know about it! Let’s be clear. This decked-out-to-the-full-extent-of-its-life 1987 Suzuki Samurai is not a “cute little Jeep” and you will leave it alone! It’s serious! It has a ladder, and some mounted LED lights, and some super serious reflectors! You will respect it!!!! Even the license plate declares it independent to excess! Not a heckin Jeep, OK?! Just How Many Times Can You Jump A Suzuki Samurai?